For this year’s Festspiele, Baden-Baden has selected the 1875 Viennese version of ‘Tannhäuser’ by Richard Wagner (1813 – 1883). Once more the city in the Black Forest has become an alternative to Bayreuth, after ‘Parsifal’ in 2004 and ‘Lohengrin’ in 2006, and with the quality of their performances and glamour of the place, Baden-Baden can stand up to its neighbour. And for this year’s ‘Tannhäuser’ there are other resemblances with Bayreuth: its director Nikolaus Lehnhoff once was Wieland Wagner’s assistant and this year’s Tannhäuser Dutch tenor Frank van Aken was last summer’s Tannhäuser in Bayreuth. The premiere of ‘Tannhäuser’ took place in 1845 in Dresden with little success. Wagner added a different ending (Elisabeth’s death) for a second version in Weimar in 1849. Twelve years later the opera was translated into French and performed in Paris. For this version the initial scene at the Venus’ mountain was extended to a great bacchanal, so that a ballet scene could be included to fit the contemporary, French taste. Not completely satisfied with his work, Wagner changed the partiture again, translating the text back to German, linking the overture to the first scene, using two additional orchestras for the Venusberg scene and adding drums, bells, harps, horns and trumpets to the original score. This is the so called Vienna version, which was first performed in 1875 and is rarely performed. Frank van Aken is an outstanding Tannhäuser, a heroic tenor with strong lyric and dramatic qualities, who can stand up to the fullest orchestrations. Surprisingly, Van Aken sings in this co-production of the Festspielhaus Baden-Baden and the Nederlandse Opera Amsterdam, but didn’t perform it in the Dutch theatre. Solveig Kringelborn is a brilliant Elisabeth with clean high notes and a beautiful sound. Waltraud Meier is a glowing Venus with an amazing vocal transition from the lines where she adulates Tannhäuser to the point where she curses. The German baritone Roman Trekel as Wolfram has an elegant voice and surely left nobody unmoved with his Abendstern song. Strong, gentle and sonorous was Stephen Millings as Landgraf. The same set by Raimund Bauer (a huge revolving staircase) serves through all three acts as Venusberg, Wartburg Valley and hall for the singing competition. It’s quite simple but impressive thanks to its dimensions, the lighting effects and some other tricks. 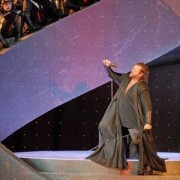 For instance, after Tannhäuser’s death a double of the singer resembling his soul ascends to heaven. 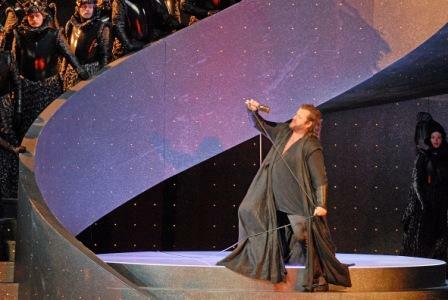 In this simple set the costumes by Andrea Schmidt-Futterer gain an important role: Elisabeth dressed in white, Tannhäuser in black, the singing competitors in golden outfits and using a microphone (the only “modern” element on stage). Very decent is also the performance of the bacchanal at the beginning of the opera. The young conductor Philippe Jordan provided an excellent and dramatic Wagnerian sound: romantic and lyrical, sublime and pathetic, dark and threatening where needed. The Deutsches Symphonie-Orchester Berlin playing impeccably and also the great acoustics of the Festspielhaus contributed to this excellent performance. A great and well deserved ovation followed after each act and even a standing ovation (yes, in Germany!) at the end.